ZINOL HEAT TRANSFER OIL is compounded with quality paraffinic base oils to provide excellent heat transfer properties in chemical processing plants. A thermally stable oxidation inhibiter is added to enhance thermal stability and resists chemical oxidation makes it suitable to withstand rapid heating. 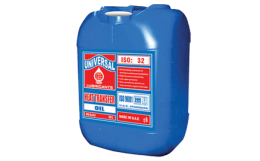 ZINOL HEAT TRASFER OIL is recommended for closed, indirect heating and cooling systems equipped with expansion tanks in all kinds of industrial. It is used in thermic fluid heating system used for oil, chemical and food processing units. Capable of an extremely long service life without deposit formation or viscosity increase. Provides good low temperature fluidity which helps easy starting of cold system. High heat transfer rates with improved operating efficiency. Flexible for combined heating and cooling cycles.